Instant Pot White Rice is an easy way to cook a pot of long grain white rice. You can control how done it gets, and this method of making rice is fairly hands-off. Pressure cooker rice is a good base for other recipes, so you can make a big batch to have on hand! Lots of rice is eaten in our house. Often times I am making something else to go with it, and I like to time it so it is ready at the same time as the main dish. 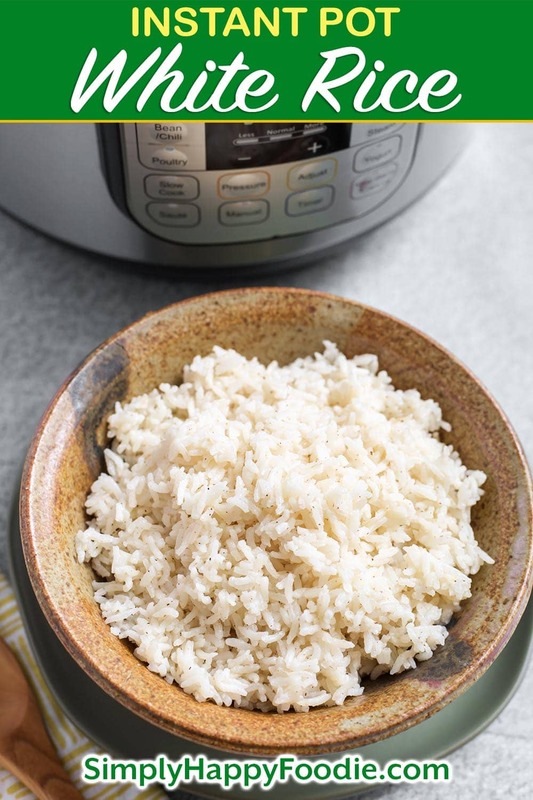 It’s not too difficult to make the conventional way on the stove top, but making Instant Pot rice is so simple, and the results are consistent. Having said that, it is good to know that not all rices cook the same. 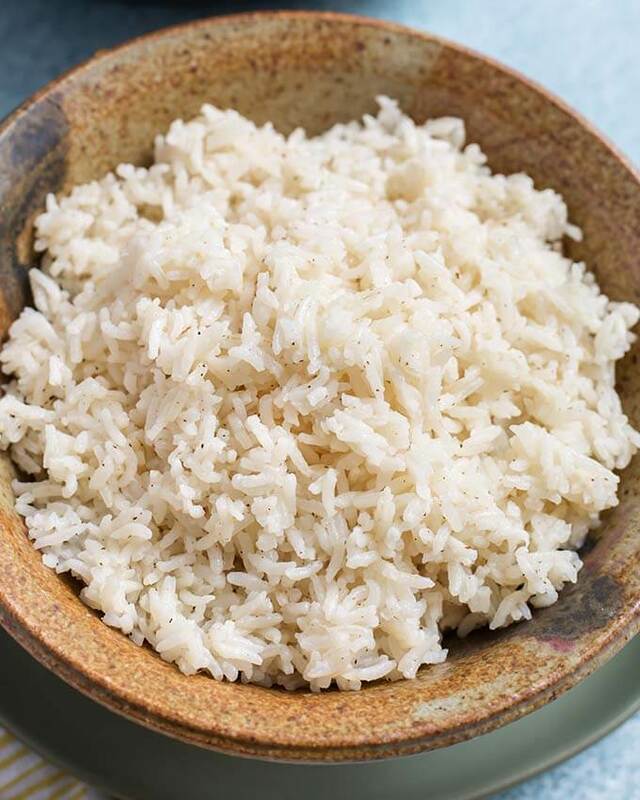 There are lots of varieties of rice available, and not too many cook in the same amount of time or with the same rice to water ratio. 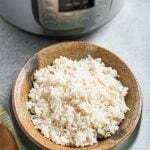 This method is for making long grain white rice. You can experiment with other types of Instant Pot white rice as well, such as basmati and Jasmine. 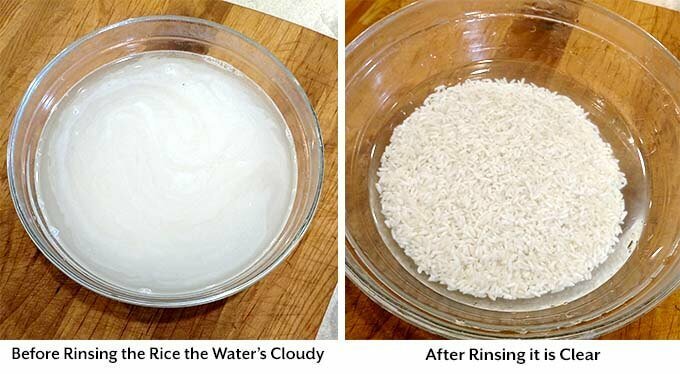 It is a good idea to rinse your white rice in cold water before you pressure cook it. Rice has a lot of starch in it and if you don’t rinse it off you can get gummy rice. No one wants that! It takes me about 5 minutes to get the water clear with 2 cups of white rice. You may be okay with a little cloudiness, but I wanted to illustrate the difference. 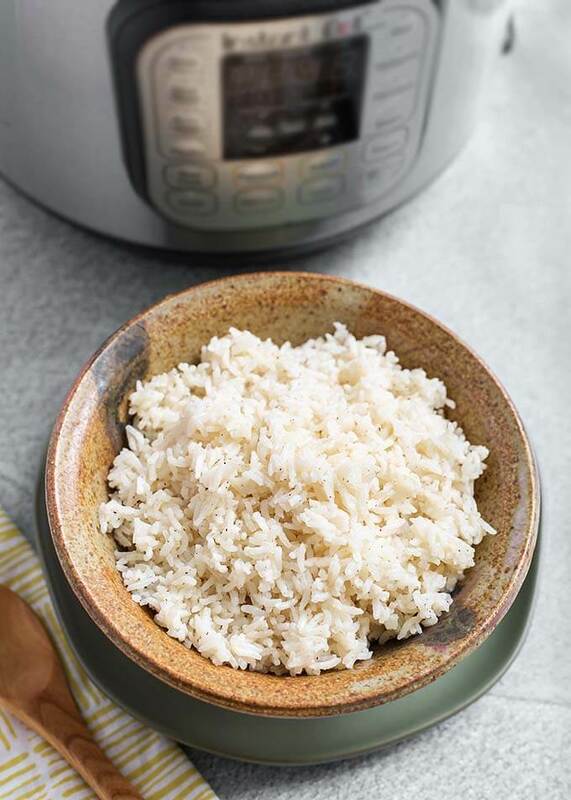 This Instant Pot White Rice recipe is a good starting point for those new to pressure cooking. After you make it once you can decide if the results are to your liking. Then, if not, adjust the timing to get your desired results. The Instant Pot RICE button has a set time and pressure level, so the best way to adjust the timing is to use the “Pressure Cook” or “Manual” button. Then you can adjust the pressure, and then the time (See NOTES in recipe card). Instant Pot White Rice is an easy way to cook long grain white rice. You can control how done it gets, and pressure cooker rice is fairly hands-off method. Add all of the ingredients to the inner liner pot of the Instant Pot®. Press the Rice button* (or use the dial on the Ultra). When the cook cycle ends turn the steam release knob to the Venting position to do a Quick Release of the steam. Turn off the pot. When the pin in the lid drops down open the lid and fluff the rice with a fork. Serve immediately, or save for another recipe. *If you don't have the RICE button, set your pressure cooker to LOW pressure for 12 minutes. Quick Release. If you don't have the LOW pressure option, set time for 2-3 minutes (depending on how soft you like your rice) at High pressure. After cook cycle finishes, let the pot sit undisturbed for 10 minutes, then do a Quick Release of the steam. Follow the remaining steps. 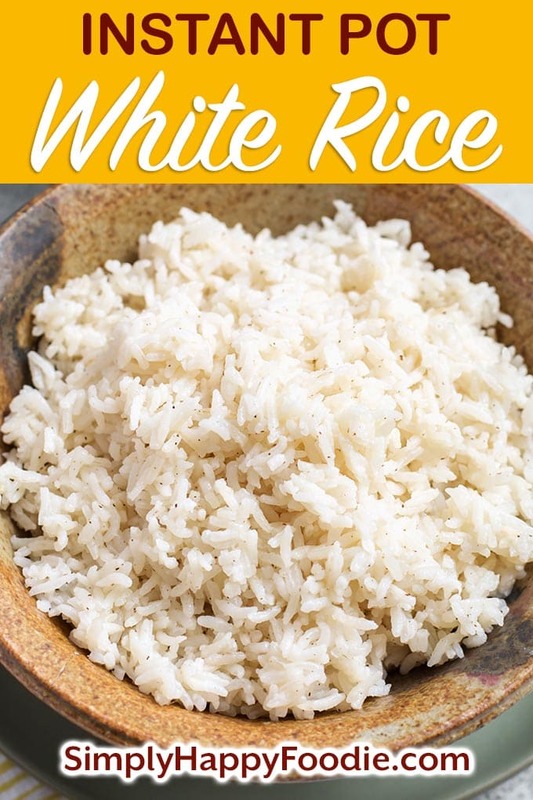 Your white rice recipe turned out absolutely perfect!